Did you make a resolution to take better care of your teeth in 2016? Then the Waterpik Complete Care 5.0 is the perfect gift to ask for this Valentine's Day! 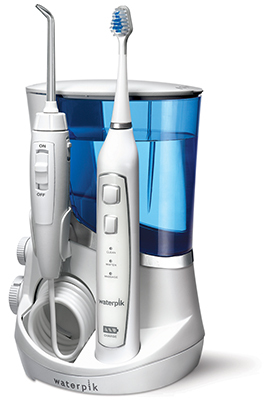 Waterpik®, a leader in innovative personal oral health care products for over 50 years, leaves nothing to chance. The company wants to make sure that every American knows that you have to brush and floss every day, in order to achieve the best oral health care results. With that in mind, Waterpik® has introduced the Complete Care 5.0 system, the ultimate compact machine that features the best tools for brushing and flossing. This amazing product saves space and eliminates the need for multiple power outlets. Waterpik® Complete Care 5.0 combines both a Waterpik ® Water Flosser and Sonic Toothbrush to create the ultimate one-two punch to maximize oral health care. Perfect for anyone with braces, implants, crowns, bridges and veneers, the Sonic Toothbrush provides the most complete brushing experience, while the Water Flosser gets deep between teeth and below the gumline to remove that hard-to-reach plaque where brushing misses. The Triple Sonic Toothbrush features three sonic modes – a Clean Mode for outstanding, every day cleaning performance; a Whiten Mode that helps gently removes surface stains and naturally whiten teeth; and a Massage Mode that helps enhance gum stimulation and circulation.& nbsp; The Sonic Toothbrush also features a deluxe recharge indicator display, a two minute timer, 30-second quadrant pacer, premium travel case, and two replacement heads. The Water Flosser provides five Flossing Tips, ten pressure settings, 90+ seconds of water capacity and can be used with your favorite mouthwash. The Waterpik® Water Flosser is clinically proven up to 50% more effective for improving gum health than traditional string floss, up to two times as effective for improving gum health around implants and up to three times as effective for removing plaque around braces than using string floss. I really love this Complete Care system! I really struggle with remembering and making time for flossing. With this system sitting right on my sink right with my toothbrush, I am reminded every time I brush to floss! It's easy to use and works great! This is definitely a must have for all people looking to take better care of their teeth this year! You can purchase The Waterpik® Complete Care 5.0 System will be available at fine retailers for a suggested price of $99.99. Waterpik is generously offering (1) Complete Care 5.0 to a lucky winner!